Hawaii governor forms command to 'streamline military response' to Kilauea volcano eruption on Big Island. Pacific Business News. Joint Task Force 50 in position to support county government. Tribune-Herald. Brig. Gen. Kenneth Hara spoke to media at the Keaukaha Military Reserve on Wednesday afternoon, announcing the approval of the request for the Joint Task Force 50. Big Island Video News. Press Release: Gov. 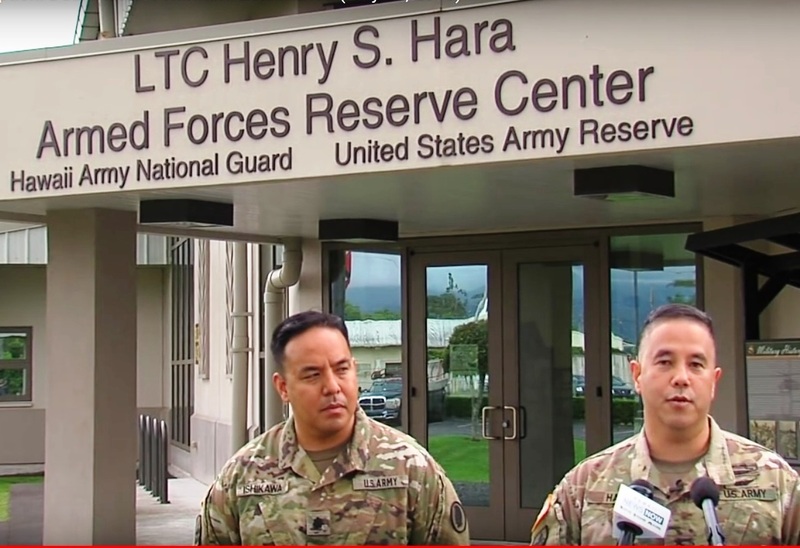 David Y. Ige has announced the formation of a Dual-Status Command, Joint Task Force 50 (JTF) in response to the Kilauea lava flow on Hawai‘i Island. Gov. Ige’s formal request to appoint Brig. Gen. Kenneth Hara was submitted on Tuesday, May 15 and approved by Secretary of Defense James N. Mattis earlier today. Governor's Office. An explosive eruption from Kilauea's summit on Thursday morning sent an ash plume soaring some 30,000 feet into the air, and officials are warning that ash emissions will cover a large part of the Big Island. Hawaii News Now. Explosive eruption at Kilauea summit; those in area advised to shelter in place amidst ash plume. Star-Advertiser. Hawaii Volcano Observatory officials on Thursday confirmed that an explosive eruption occurred at the summit of Kilauea. As a result, the National Weather Service issued an ashfall advisory for the Ka'u District of the Big Island. Officials say the ash plume reached 25,000 feet. Hawaii News Now. Hawaiian Volcano Observatory reports that an explosive eruption at Kilauea summit has occurred at 4:17 a.m.. The resulting ash plume may affect the surrounding areas. The wind may carry the ash plume north towards Kau, Volcano, Mt. View, Keaau and as far as Hilo. KITV. A series of sharp, shallow earthquakes rattled the summit area of Kilauea volcano Wednesday morning, and the gray plume from an ash eruption at the summit crater continued to distribute volcanic ash as far away as Kau and Pahoa village. Star-Advertiser. Earthquakes Batter Roads As More Ash Spews From Kilauea. The state is forming a joint task force to handle mass evacuations of the Puna district if lava flows cover major roads and isolates the area. Associated Press. Emergency officials are keeping a close eye on Highway 11 after cracks appeared Wednesday on the road near the entrance to Hawaii Volcanoes National Park. KHON2. Kilauea’s summit was rocked by shallow earthquakes Wednesday as the volcano’s caldera inside Hawaii Volcanoes National Park subsides along with its magma chamber. Tribune-Herald. Volcanic gas emissions remain elevated throughout the area downwind of the fissures, and magma continues to be supplied to the lower East Rift Zone. Big Island Video News. Geologists: Kilauea is no Mount St. Helens. Hawaii News Now. A petition urging Hawaii Gov. David Ige to sign a bill into law that would prohibit the sale of sunscreens containing certain ingredients found to be harmful to marine life is gaining traction, having garnered close to its goal of 40,000 signatures. Pacific Business News. New Super PAC With Pro-Rail Ties Emerges In Hawaii Elections. The group, All Hawaii Stand Together, has ties to the pro-rail Pacific Resource Partnership that has been a big player in past elections. Civil Beat. The late U.S. Sen. Daniel Akaka will lie in state at the Capitol rotunda Friday and Saturday and be eulogized during two public services and one private service before being laid to rest at the National Memorial Cemetery of the Pacific at Punchbowl. Star-Advertiser. The family of the late Sen. Daniel Akaka released new information on Wednesday concerning the schedule for his memorial service. Hawaii News Now. Plans for the construction of a new Hawaii State Hospital facility were unveiled today. Hawaii Public Radio. Architects, designers and state health officials Wednesday pledged that a new Hawaii State Hospital in Kaneohe would be more secure, safer for staff and better suited to help patients with mental health issues who are court ordered for treatment. Star-Advertiser. Security upgrades planned at State Hospital in wake of high-profile escape. Hawaii News Now. Press Release: Governor David Ige and the Hawaii Department of Health today unveiled the security features for a new, $140 million, state-of-the-art Hawaii State Hospital building to enhance the safety of patients, employees and the community. Governor's Office. Health department director Dr. Virginia Pressler looks forward to retirement. Dr. Virginia Pressler announced last week that she will be retiring after three and a half years with the state Department of Health. KHON2. Lawsuit: Managers Took Bribes At Low-Income Rentals. Executives at a Hawaii property management company say the allegations are false and upsetting. Civil Beat. Pacific Office Properties considering shutdown. A local company that owns three Honolulu office tower properties lost more money in the first quarter and let investors know its board is considering alternatives that could include dissolution. Star-Advertiser. ‘Lime’ Rental Scooters Invade Honolulu With Mixed Results. The new motorized rental scooters are appearing on sidewalks in Honolulu, but the mayor is not pleased. Civil Beat. Honolulu home prices rose by 4 percent in April, and Hawaii’s largest market was one of the few in the United States where inventory is growing, according to the May National Housing Report from Re/Max. Pacific Business News. “Faith Betrayed,” a Honolulu Civil Beat story about Guam’s reckoning with the torturous legacy of decades of sexual abuse by local priests, has been awarded the Sally Jacobsen International Perspective Award from the Associated Press Media Editors. Civil Beat. Lava burning up tourism: Economic impact to Hawaii Island could be worse than thought. West Hawaii Today. No-Entry Zone Established for Hawaii Electric Light Crews in Leilani Estates. Big Island Now. No-entry zone established for Hawaii Electric Light crews in Leilani Estates. KHON2. The eruptions in lower Puna won't seem to let up as several older fissures continue to reignite, shooting lava into the air. Hawaii News Now. Cultural practitioner performs oli (chant) in honor of goddess Pele. While the eruptions along the East Rift Zone and volcanic activity at Halemaumau Crater are awe-inspiring, they are also significant to the Hawaiian culture. KHON2. The Hawaii Tribune-Herald donated warehouse space to the American Red Cross for its ongoing lava disaster relief efforts. Tribune-Herald. Oahu Publications Inc., the parent company of the Honolulu Star-Advertiser and the Hawaii Tribune-Herald, is providing warehouse space to the American Red Cross in Hilo for the storage of goods to be used at its shelters. Star-Advertiser. Preparing to serve up environmentally friendly plate lunches. Ban on polystyrene foam products takes effect Dec. 31. Maui News. Vodka maker purchases Maui pineapple farm. Principals of a California-based maker and distributor of distilled spirits have bought a pineapple farm on Maui that was once part of a more than 100-year-old plantation. Star-Advertiser. New ownership announced for Haliimaile Pineapple Co. Company acquisition ensures Maui Gold pineapple will continue. Maui News. The owners of Haliimaile Distilling Co. have purchased Haliimaile Pineapple Co., producers of Maui Gold pineapple in Hawaii. Pacific Business News. Hawaiian Airlines started new daily nonstop flights Wednesday between Maui’s Kahului Airport and San Diego International Airport. Star-Advertiser. The County Council approved the purchase of property along the Hanalei River Wednesday. Garden Island. Water quality has cleaned up in some areas on Kauai’s North Shore after the April floods, but the state Department of Health still has a brown water advisory for some places on the island. Garden Island. Mud is smothering the coral in Hanalei Bay, according to one resident who explored the reef there Saturday. Garden Island. Kauai's legislators are slated to be at the Lihue Business Association meeting 7:30 to 9 a.m. May 24 at Duke’s Canoe Club. Garden Island.